Things move fast in the world of tech and travel. In just a few short years, our Christmas lists have evolved from wishing for a cutting-edge VCR (1996) to ­­­wearable devices (2016). Travel has evolved too, with hotels upping their tech game to keep current. How did we ever travel before technology? It was only a few years ago that maps helped me find my way. But I had to pull off the road and study the map. If things went well, I would get back on the road and find my destination with only a few missed turns. These days, Google Maps talks me through the entire route while I keep my eye on the road and never miss a turn. We have partnered with Techlicious to celebrate the marriage of technology and travel with a series we call TNT (Tech and Travel). It’s sponsored by the Consumer Technology Association (creators of CES, the Consumer Electronics Show). We have been taking the show on the road. 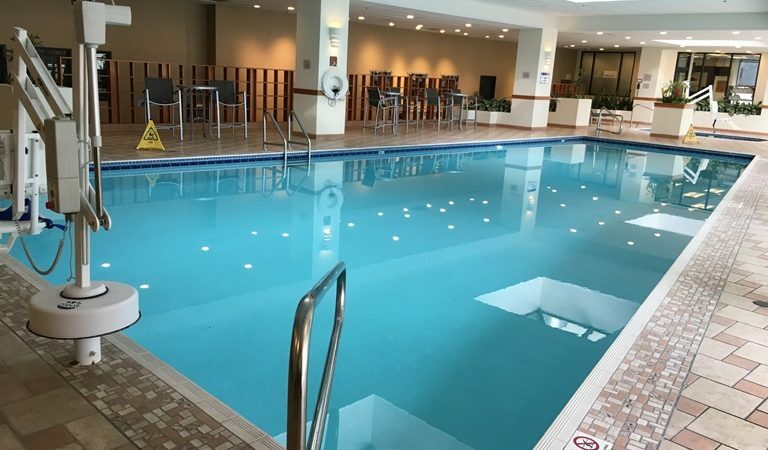 The most recent stop: the Hilton Salt Lake City Center in Salt Lake City, Utah, where we talked about the best tech holiday gift ideas for 2016. This hotel has embraced the tech and travel revolution. 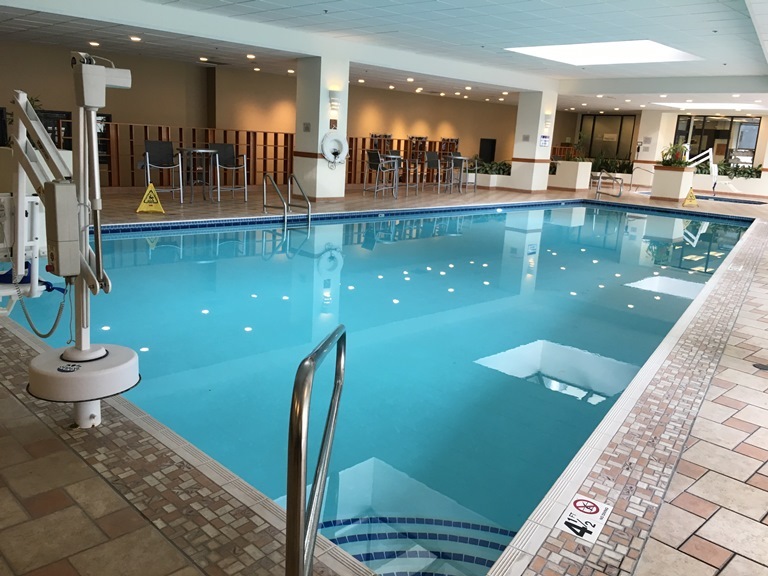 While it’s easy to think of a Hilton as primarily a business hotel, it has plenty of features that appeal to families, starting with an enticing pool. 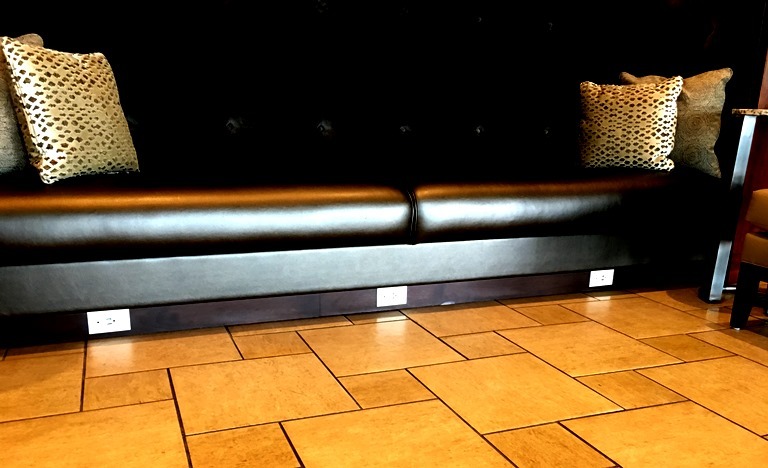 The best tech feature of the Hilton: outlets everywhere. That’s not surprising in the rooms, of course. But at the Hilton Salt Lake City Center, the outlets are all over the lobby too. That makes it easy to keep technology-dependent tweens and teens charged up (and, therefore, happy) on a family vacation, or while waiting to head to the airport for a flight home. Keyless entry that lets you check in remotely and use your smartphone to open your room. I wish I had realized that. I definitely would have checked in during my cab ride from the airport and headed straight to my room when I arrived at 11:30pm local time, 1:30am to my jet-lagged body that was operating on East Coast time. While the check-in at the front desk was painless, even that extra five minutes was unnecessary. 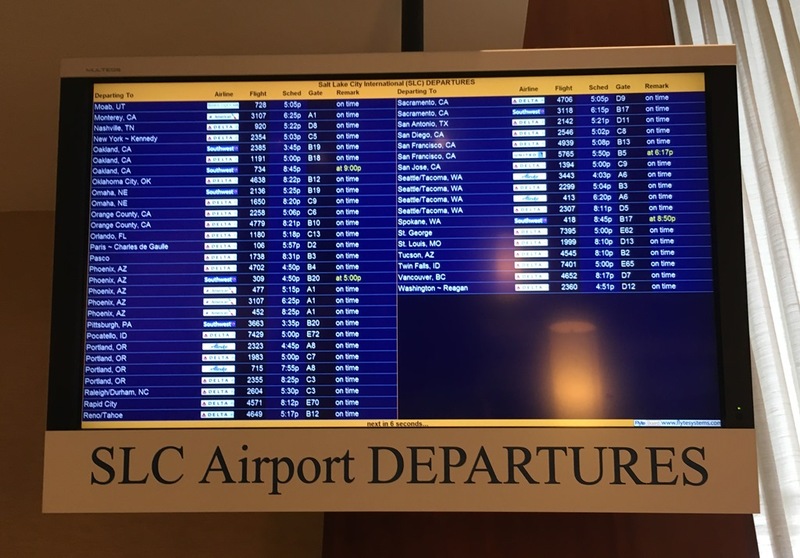 An electronic board near the concierge desk in the lobby that displays Salt Lake City Airport flight departure times. TravelingMom Tip: Skip the cab and Uber from and to the airport instead. I jumped in a cab when I arrived at the Salt Lake City Airport tired and jet lagged after a cross-country flight. I paid $30 with the tip for the 10-minute ride. We opted for an Uber when it was time to head back to the airport for the flight home. It cost less than $7. Access to the 18th floor lounge which offers panoramic views of the Salt Lake Valley and surrounding mountains. 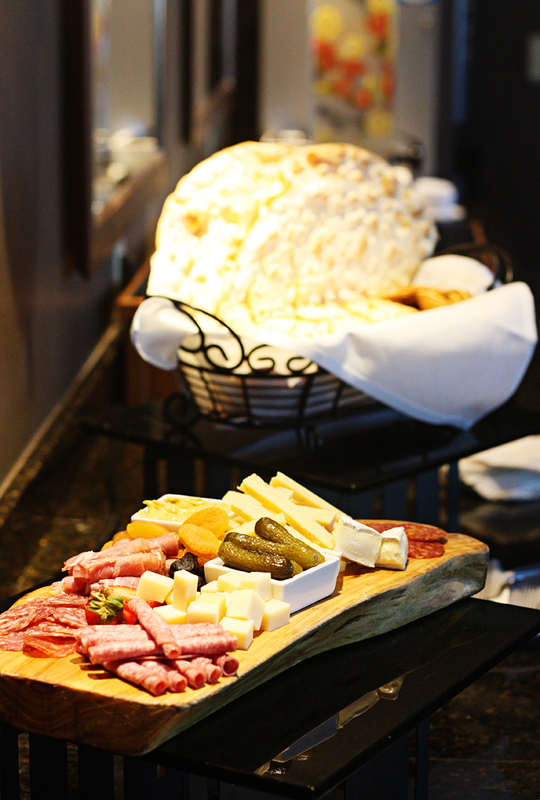 Breakfast each morning, afternoon snacks, soft drinks, water and coffee in the lounge. These are huge money savers for families, especially families traveling with ravenous teens. Breakfast alone for my family of four often tops $40. Add in sodas and water at $2 or more each and you have more than covered the additional cost. 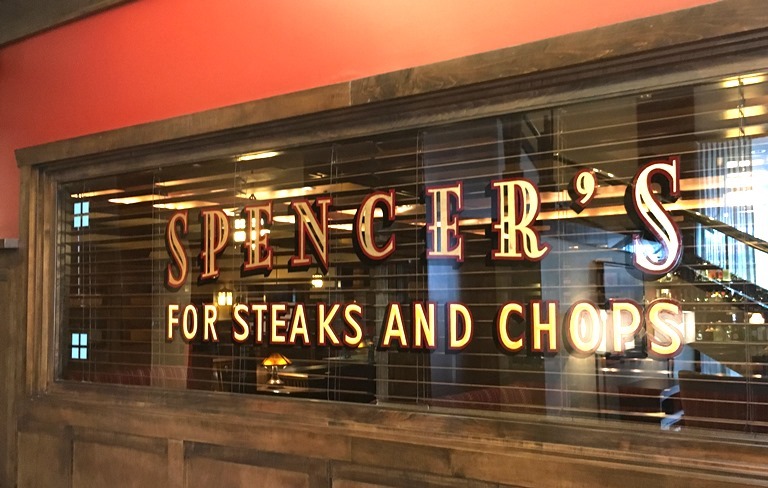 If you happen to be traveling without kids, as I was on this visit, make time for dinner at Spencer’s for Steaks and Chops. The classic steakhouse is family-friendly but pricey if you’re trying to feed a family without an expense account. That said, the bone-in ribeye steak is worth every penny. I can’t remember ever eating a more flavorful, tender steak. Ever. The bar is warm and welcoming. I found plenty of company as I cheered my Chicago Cubs to their World Series victory in Game 7. Also not to miss is the chocolate lava cake. Hilton Salt Lake City Center Hotel Executive Chef Scott Monell demonstrated how to make the cake and shared his recipe during the #TNTSLC event. It’s hard not to like something chocolate that arrives warm and gooey. 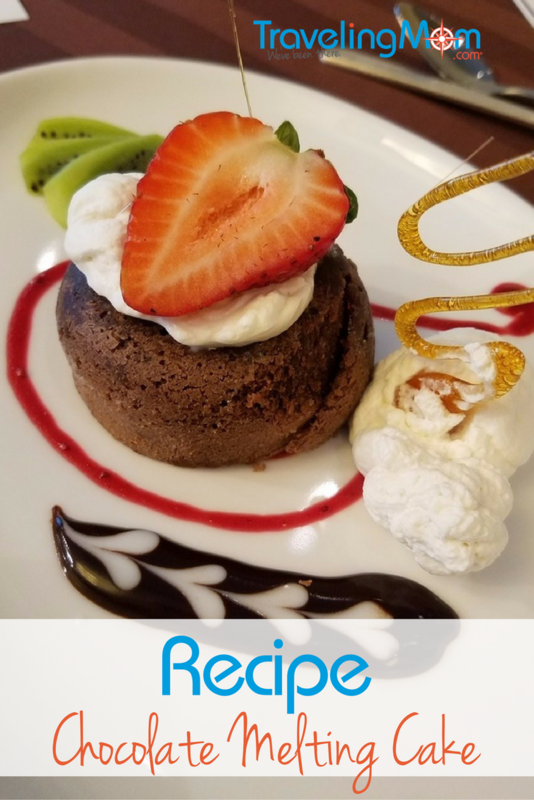 According to Monell, chocolate lava cake was discovered because of “major culinary disaster.” The chef had planned to serve individual chocolate cakes, but a cook took them out of the oven to soon. The centers where still liquefied. Since there was no time to cook them further, the Chef simply introduced the dessert as chocolate “lava” cake. 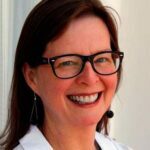 As a so-so cook, I take stories like that to heart. The next time I screw up dinner, I just need to get creative. It’s all about the way you spin the mistakes, right? Melt chocolate at low heat until soft and creamy, set aside. In separate bowl combine whole eggs, egg yolks, and warm melted butter. Then add flour and 4 oz of powdered sugar, and stir in 3oz rum and Dash of vanilla. Slowly add melted chocolate, then mix until combined and set aside. Coat the inside of four ramekins with softened butter; and dust with flour evenly (this step will help the cake to slide out easier). Add the chocolate mix, filling each ramekin ¾ of the way to the top. Place in preheated 350-degree oven for eight minutes, and let the chocolate cake rest; meanwhile, mix the fresh fruit with the leftover rum (1oz) and powdered sugar (1oz). To serve, turn the ramekin over and pop the cake out. Place in center of plate; add marinated fresh fruit, and a small scoop of vanilla ice cream if desired.